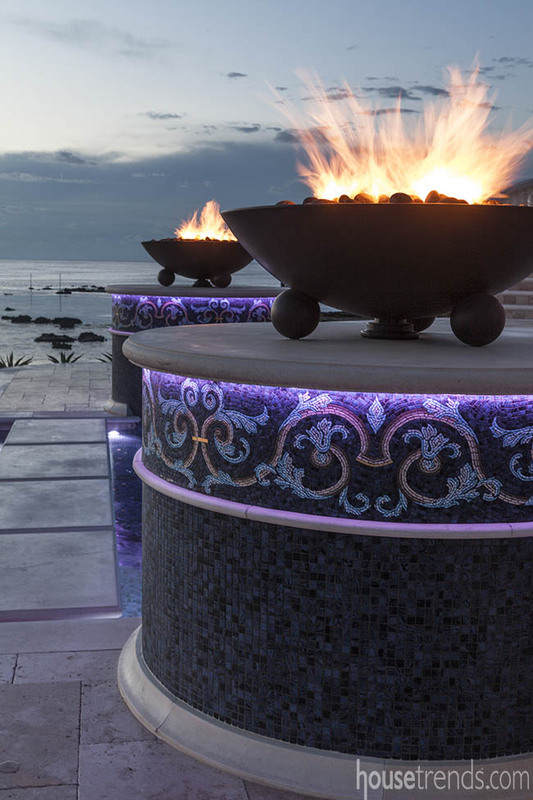 Six fire bowls elevated on pillars, wrapped in tile and LED lighting adorn the three pools. 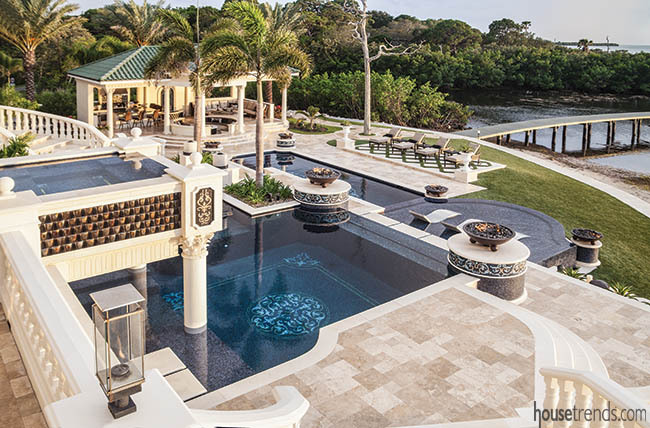 If you are lucky enough to receive an invitation to a pool party at this colossal Florida home situated on 16 acres just north of Clearwater Beach on the Gulf of Mexico, you may not know where to look first. 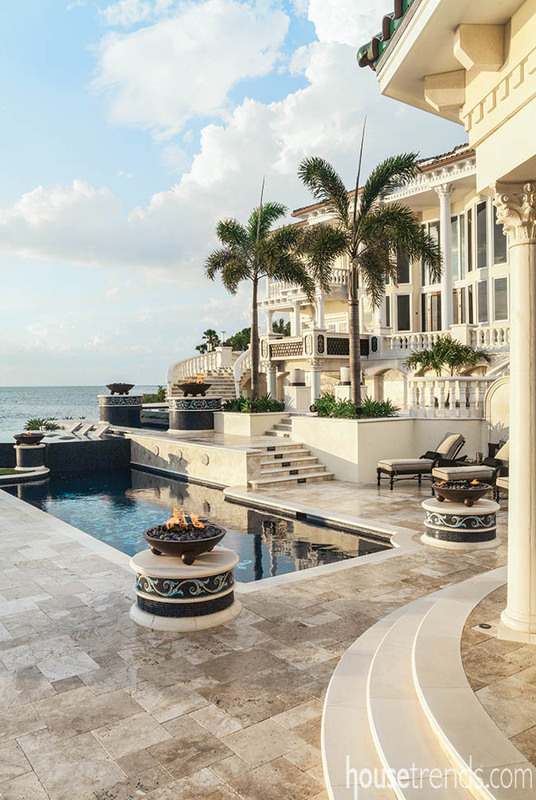 But as you take in the luxurious surroundings, one thing will be obvious in an instant: the pools, and the backyard space, are spectacular and incomparable. Designated the Amarula Sun after the owner’s yachts, the two-million-dollar plus project reflects the homeowner’s zest for life and a desire to create an outdoor living environment that complements the grandeur of his home. The homeowner purchased the property a decade ago. 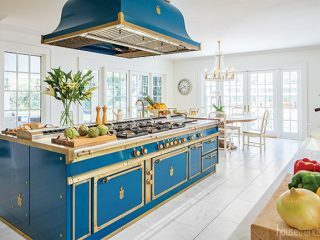 The 25,000 square-foot, four-story home was built in 1999, though the two previous owners never quite finished working on the interior spaces. 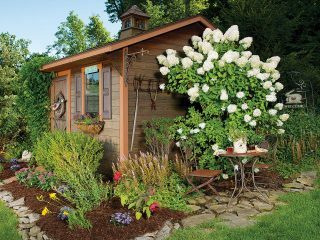 After the current owner finished the home design to his liking, he turned his attention to the back yard. 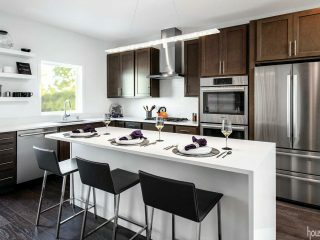 He enlisted Ryan Hughes, owner of Ryan Hughes Design/Build in Tampa, to bring his vision to life. 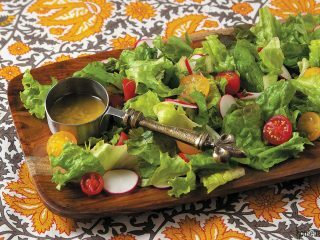 Hughes says he approaches every project with the homeowner’s tastes and lifestyle in mind. 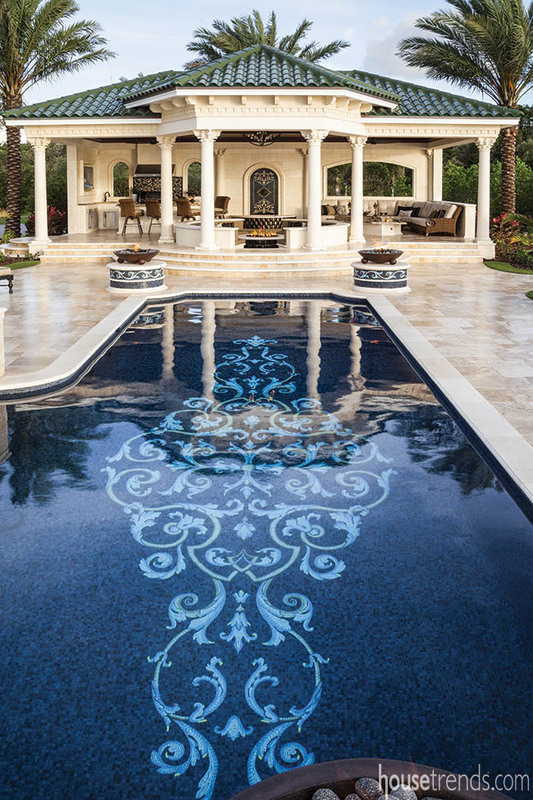 In this case, the primary criteria in designing the Amarula Sun for the homeowner were to mirror the home’s ornate interior, as well as to incorporate an element of adventure, which mirrors the homeowner’s personality and love of water. 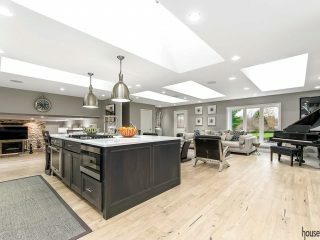 From a functionality standpoint, the homeowner also desired a sizable entertainment venue, since he regularly hosts large charitable events and other gatherings, with each area of the space serving a different purpose. 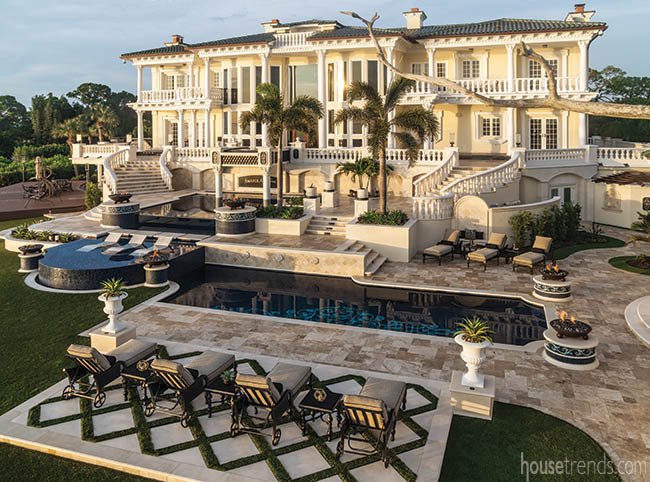 Hughes first focused on the existing pool, which was not only disproportionate to the size of the home, but it was poorly constructed, not logically positioned from an architectural standpoint, and the soil conditions were poor. To overcome this challenge, Hughes hired a soil engineer to help figure out how to support the new pool. The engineer determined that the new design had to be built on a set of pilings driven and anchored into the rock bed, about 20 feet below the surface. After they broke ground, it took about six months to prepare the foundation work before they could start building the pool. The entire project, from start to finish, took 14 months. The four pools are uniquely structured on multiple tiers. Hughes says that the goal was to assign a different function to each level. The owner requested that the hot tub be located on the second level, just steps from the main interior living space. Curved stairways on each side of the second level deck lead down to the lower level, where the other three pools, and the pool pavilion, await. The hot tub cantilevers over the edge, with water cascading into a 27×20 foot, 10-foot deep plunge pool, with a grotto inside. The waterfall and lack of a shallow end in this pool fulfills the homeowner’s “adventure” requirement, which Hughes calls the main “play” pool. “When you get into this pool, you feel like you’re in a deep ocean; you’re forced to have to swim because you can’t touch the bottom,” he says. 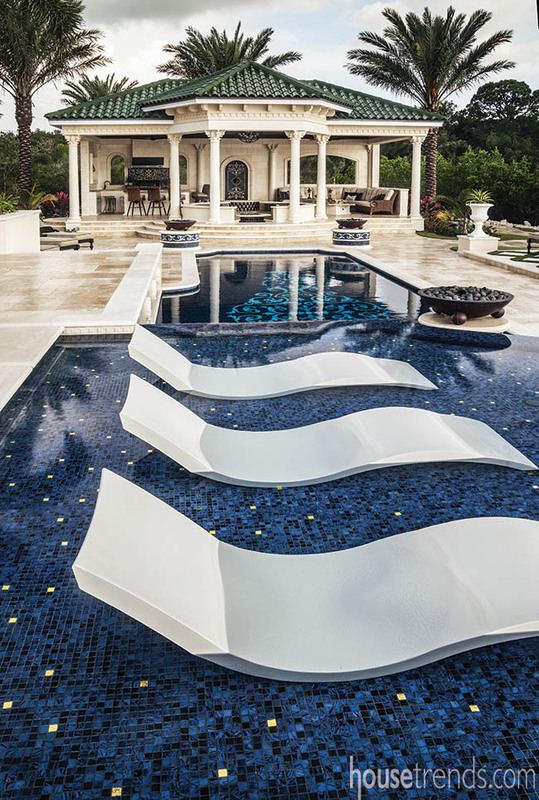 This deep pool then spills over a 14-foot wide acrylic wall and into a 15×15-foot, nine-inch deep lounge pool, which features an infinity spillover on three sides. 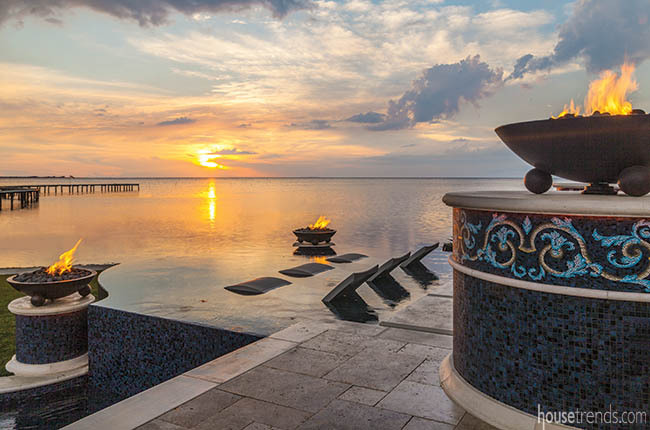 Three custom fiberglass resin chairs are submerged into the lounge pool, allowing for spectacular views of the Gulf. “If you’re in the lounge pool and looking back toward the main pool and the house, you can see the swimmers inside that main pool, almost like a viewing window,” says Hughes. Rounding out the water elements of the space, the lounge pool spills into a lower 40-foot long lap pool that starts at three feet deep and ascends to six and a half feet deep. 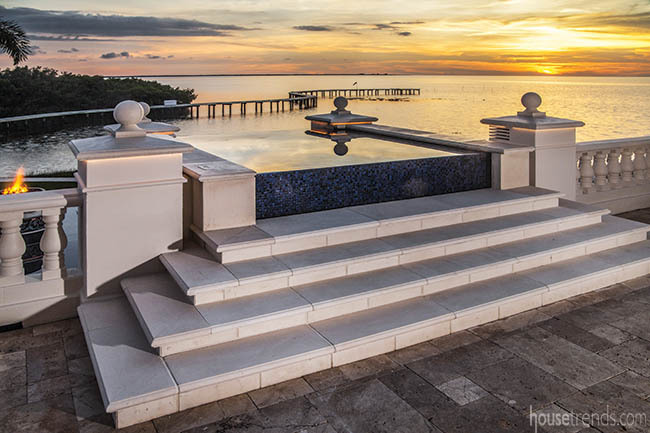 The design intent is that all paths lead back to the pillared pool pavilion, to make the pavilion alluring but to not obstruct the views of the Gulf. “Typically, if there is going to be a pool pavilion, we’ll put that as the backdrop to the main viewpoint of the pool, but in this case, the Gulf of Mexico is the backdrop,” says Hughes. As water is constantly in motion, so should be the guests. “All the water, starting with the spa, is moving from pool to pool. Subconsciously, the water is guiding you down the stairs to the direction of the pavilion, where you want everyone to end up,” says Hughes, who adds that the pavilion is perfectly placed on the centerline of the lap pool. 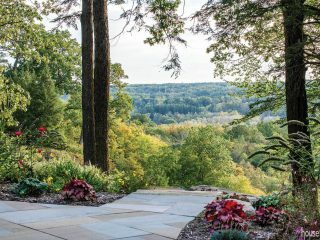 Walking along the tumbled travertine decking will lead guests to the circular fire pit, the entry point to the pavilion, around which 12 guests can comfortably gather. 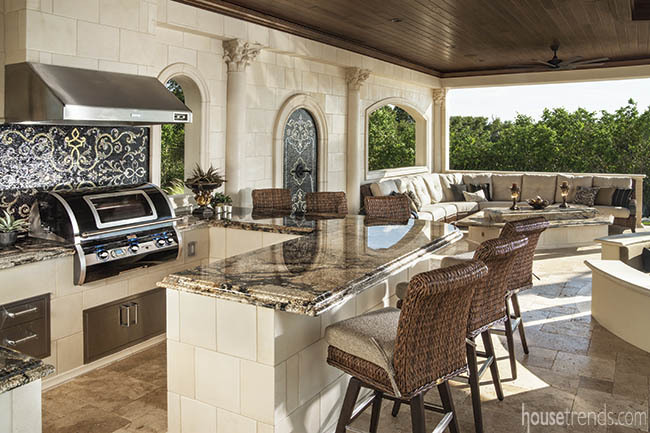 A large sectional sofa and a beautiful outdoor kitchen, complete with an elegant backsplash and a Fire Magic grill, round out the accouterments. 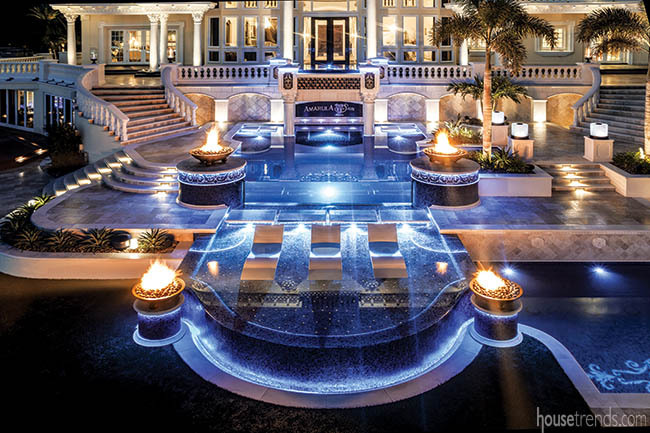 If the intricate layout of the four pools isn’t enough of a “wow” factor, Hughes integrated striking designs, both in and around the pools, for extra oomph, as well as to reflect the client’s life. “His lifestyle is all about the water and the ocean,” says Hughes. 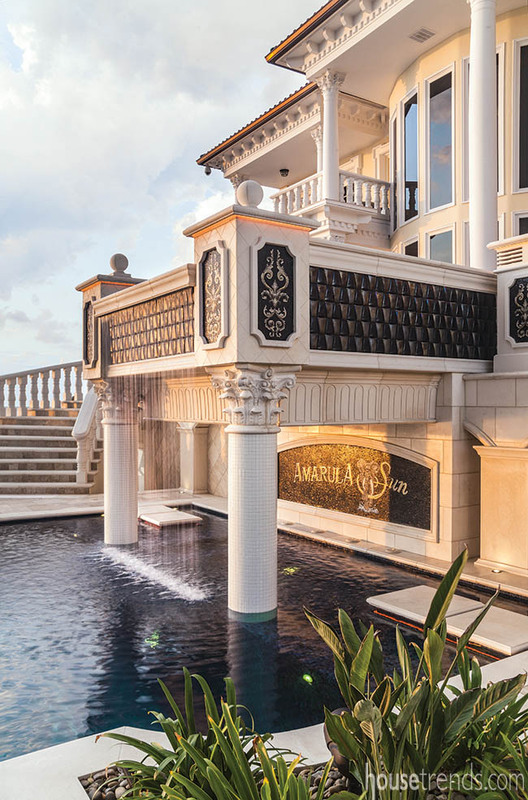 Therefore, using hand-cut mosaic tile, Hughes incorporated the Amarula Sun name and elephant logo in the main pool underneath the hot tub, the client’s name for his fleet of boats. The blacks and golds present in the logo are found elsewhere throughout the backyard space, such as in the medallions that encircle the hot tub and the 24-carat gold tile seen sparkling on the floor of the lounge pool. Fire and light are also essential features, particularly as much of the homeowner’s entertaining is done at night. 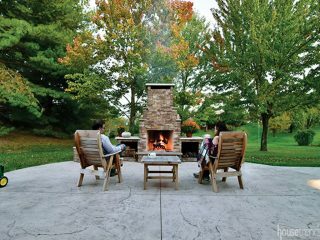 In addition to the fire pit in the pavilion, rounded fire bowls are elevated on various pillars surrounding the pool area. Hughes hid LED light strips into coves that he built into the concrete; all of which change colors and are controlled by a DMX system that allows you to create different color themes or even set it to music. You don’t see the actual fixtures, just the glow of the light. 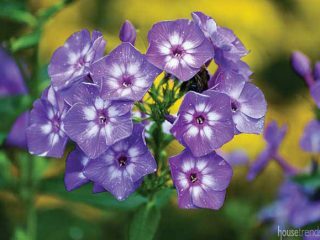 Hughes adds that the lighting and fire features also meet all three of the owner’s criteria. 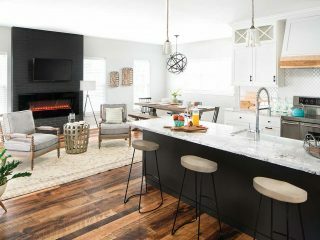 Not only do the lighting choices and fire give off an animated, adventurous vibe, both elements act as another facet of the “wow” factor that the owner was seeking. And, the lighting gives the space an entertainment-friendly vibe at night. Hughes labels the elegant interior as “Versailles-esque” with 30-foot ceilings, massive crown moldings, gold leaf and hand-cut mosaic medallions throughout. 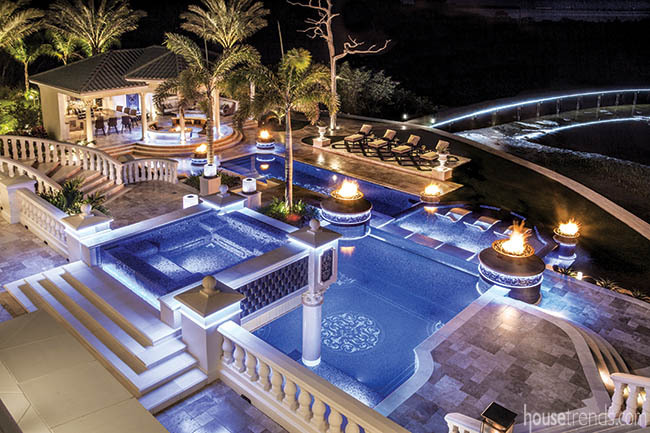 Now, that opulent home is equally matched with a spectacular outdoor haven.